Shinzō Abe is a Japanese politician. 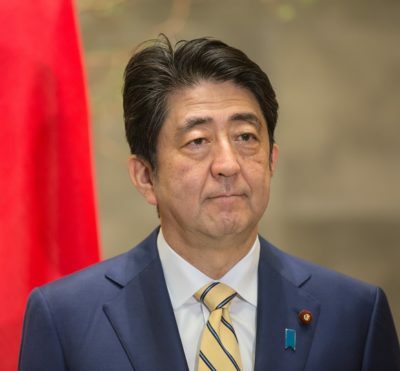 He has served as Prime Minister of Japan, since December 26, 2012, and was previously Prime Minister, from September 26, 2006 to September 26, 2007. He has been President of the Liberal Democratic Party, since September 26, 2012, and previously from September 20, 2006 to September 26, 2007. He was also previously Chief Cabinet Secretary, from October 31, 2005 to September 26, 2006, and has been a Member of House of Representatives, since July 19, 1993. Prime Minister Abe is the son of Yoko (Kishi) and politician Shintaro Abe. He is married to Akie Abe (born Akie Matsuzaki). Prime Minister Abe’s paternal grandfather was Kan Abe (the son of Abe Ayasuke, or Ayasuke Abe in Western naming order, and of Abe Tame, or Tame Abe in Western naming order). Kan was born in Nagato, Empire of Japan, and was a politician. Prime Minister Abe’s paternal grandmother was Shizuko Hondō (the daughter of Hondō Tsunejiro, or Tsunejiro Hondō in Western naming order, and of Hideko Ōshima). Hideko was the daughter of Ōshima Yoshimasa, or Yoshimasa Ōshima in Western naming order. Prime Minister Abe’s maternal grandparents were Nobusuke Kishi (born Satō, the son of Satō Hidesuke, or Hidesuke Satō in Western naming order, and of Satō Moyo Shigeyo, or Moyo Shigeyo Satō in Western naming order) and Ryōko Kishi. Nobusuke was Prime Minister of Japan, from 1957 until 1960. Moyo was the daughter of Satō Nobuhiko, or Nobuhiko Satō in Western naming order, and of Kunihiro Mine, or Mine Kunihiro in Western naming order. Correction for Satō Shigeyo: Her given name should be Moyo, not Shigeyo, and was the duaghter of Satō Nobuhiko, or Nobuhiko Satō in Western naming order. Shigeyo’s mother was Kunihiro Mine, or Mine Kunihiro in Western naming order. Yoshiko’s maiden surname is Kishi, and was the daughter of Kishi Nobumasa, or Nobumasa Kishi in Western naming order. So is the name Satō Moyo Shigeyo? And who is Yoshiko? Kan was the son of Abe Ayasuke, or Ayasuke Abe in Western naming order, and of Abe Tame, or Tame Abe in Western naming order. Shizuko was the son of Hondō Tsunejiro, or Tsunejiro Hondō in Western naming order, and of Hideko Ōshima. Hideko was the daughter of Ōshima Yoshimasa, or Yoshimasa Ōshima in Western naming order. Hidesuke was the son of Satō Nobuhiko, or Nobuhiko Satō in Western naming order.